Testing of Russia's new MiG-35 'Fulcrum F', the next generation fighter jet to follow the MiG-29, is expected to be completed late this year or early next year and could soon join units in 2019, MiG directory Ilya Tarasenko confirmed. 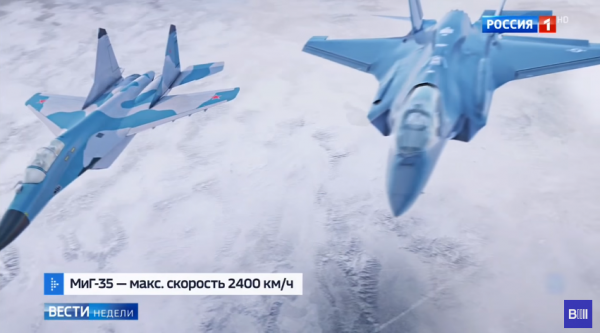 According to Anastasia Kravchenko, spokesperson of MiG, the new aircraft boasts of stealth capabilities, extreme maneuverability, and enhanced power, with 12 percent more engine power compared with its predecessors. It is also capable of taking off even from a very short lane; could take off and land even on unprepared airfields; and be kept without a hangar for a few months. And its engines could be easily swapped in case of active operations within 58 minutes. "If we're talking about fifth-generation technologies, we can safely say that we have some of them integrated and not in tests, but in use by this jet," Kravchencko told Military.com. Earlier reports also noted that the aircraft will feature thrust-vectoring engines, an inherent feature found in the F-22 Raptor and Russia's SU-35, but Kravchencko said that the although the engines had been tested, it would be offered only as an available option, Business Insider noted. Although she did not reveal any details about specific clients, she said that courting customers usually come from south and southeast Asia, Latin America, and Kazakhstan. The export model of the Russian MiG-35 is slated to be delivered by the end of the decade, IHS Jane reported. The new MiG-35, which has been in development for over a decade, is expected to be showcased at the MAKS Air Show outside Moscow next month as engineers finalize aircraft testing. Kravchencko also noted that it is yet to be determined if the fighter will be featured in a static display or aerial demo. Meanwhile, Tarasenko did not reveal how many MiG-35 aircrafts will be produced, although he told HIS Jane in an interview on June 24 that the Russian Aerospace Forces will "gradually replace all the current MiG-29 aircraft." Russia currently has around 350 MiG-29s in the fleet to pair with heavier models Sukhoi Su-27 Flanker and MiG-21 Foxhound aircraft.